“Fresh off the success of her 2018 Get Over it! 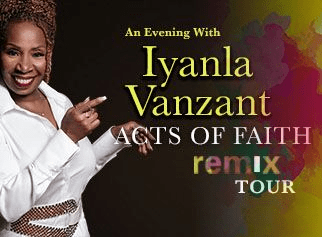 Tour, Iyanla Vanzant, celebrated spiritual teacher, New York Times best selling author, legendary speaker, and Emmy Award winning television personality, known for her work as the host of Iyanla Fix My Life on OWN, returns to the stage in 2019 with her Acts of Faith Remix at Phoenix Symphony Hall. May 29th @7:30pm.